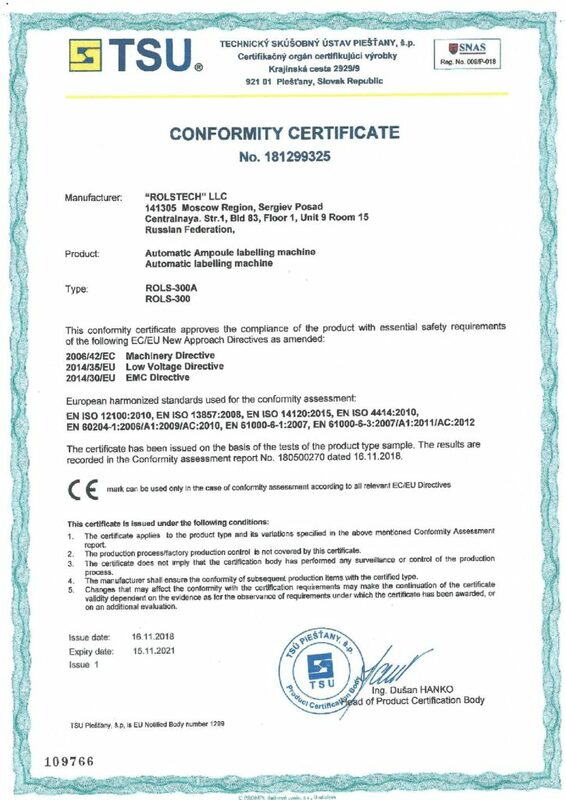 Possibility to apply self-adhesive labels on ampoules, vials and cartridges. Auto synchronization of all moving parts when changing the conveyer speed. Label is pulled through be the feeding and pressing roller. Feeding table for container loading from cassettes with a feeding and pressing device, and with possibility to use different formats of the cassettes. Speed of the starwheel and the container moving device ensures proper container feeding to the conveyor. The speed of the conveyor, wrap-around belt and labeling head is synchronized automatically. For variable data application by means of thermal printing. Printing from 1 to 3 lines on horizontal and vertical axis. Standard set of digits 100 pcs. (0-9 digits – 10 pcs each, spacers). Printing type: 1,5mm, 2mm, 2.5mm. Additional symbols (option). Thermal tape pulling is adjusted from the control panel. Time interval is adjusted from the control panel. Thermo controller to keep the preset temperature of the printing head. Sensor for detecting torn label tape. 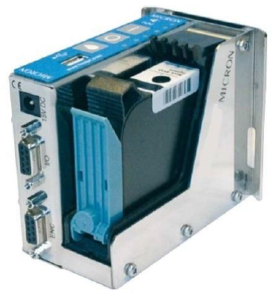 Micron — a unique compact printer with integrated controller, which suits for integration in various production lines that require low cost solution. TIJ 2.5 technology by Hewlett Packard Company. Files for printing are created with the help of the supplied software and transmitted to the controller via USB-key. The message can be stored in the printer’s internal memory. Printing with 300 x 300dpi resolution. Graphics, counters, text, numbers, barcodes (fixed), date and time (permanent and actual), 3 print fonts (True Type). Printing height 12.7mm. The printer has no concept like «number of lines». It prints everything you can place within 12.7mm space. This unit will reject faulty containers without stopping the machine. The containers are rejected in case of signal receiving from one of the sensors described above (see “Options”) or in case of the label absence on the tape roll. Sensor will give signal to stop the machine or reject container in case of label absence. Single-line laser scanner Leuze BCL 21 S M 310. The scanner is controlled from the control panel of the machine. Speed 1000 scans/с for М version. 800 scans/с for versions N, F.
This system is designed to control the barcode applied on the label. In case of wrong bar code detection, the machine stops or rejects the container with the wrong label. System includes a video sensor with integrated display and lighting, which is controlled by a programmable machine controller. 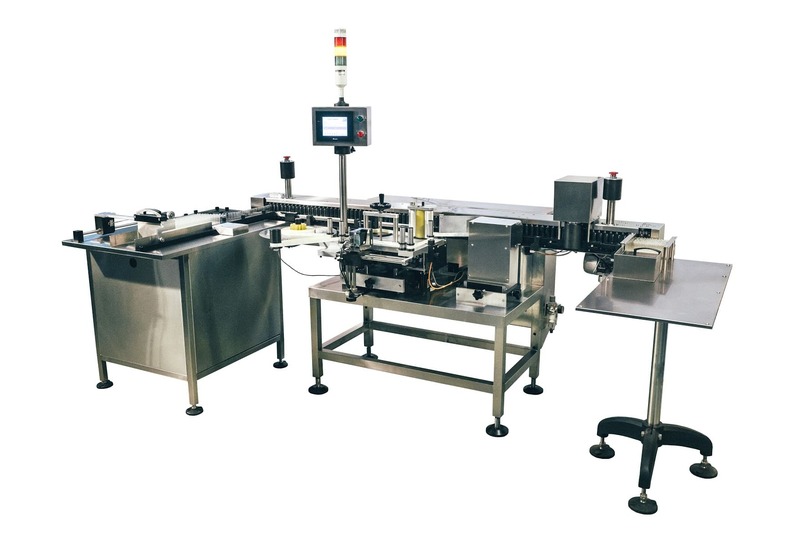 In case of wrong code detection on the label, the machine stops or rejects the wrong ampoule (with optional rejection unit). System includes a video sensor with integrated display which is controlled by a programmable machine controller. System monitors the printing quality in accordance with the previously set range of pixels for every object in a certain scanning area, as well as in accordance with the numbers of objects in this area. In case of wrong image detection (different from the previously set image), the machine stops or rejects the wrong container (with optional rejection unit). Easy system set up without PC. Resolution can be set up to 752×480 pixels. 30 programs in the memory. «Angara» — Automated Label Quality Control System on objects with different texture. 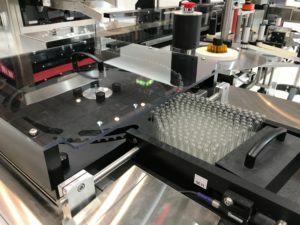 The system is based on digital cameras of Basler AG company (Germany) and is designed to check the quality of a constant (applied in the printing office) and variable printing (applied with industrial printer). 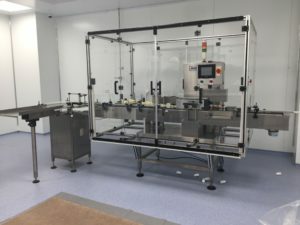 Transparent safety guards are installed around the machine to prevent access to the moving parts during machine operation. Interlocks prevent start of the machine, or stop the machine during operation when the doors are opened.